Dulaney (Md.) 2021 guard Ryan Conway. SALISBURY, MD - St. George’s (DE) 2019 guard Nah’Shon "Bones" Hyland was putting on a show against Dulaney (Md.) at the Wicomico Youth & Civics Center on Thursday night, appearing ready to single-handedly bury the Lions under a barrage of highlight-reel buckets. Dulaney (Md.) weathered the storm, though, and when it was time to make their move, they took full advantage. 2021 guard Ryan Conway scored 23 of his 30 points in the second half as the Lions rallied for a 70-64 win in DMVelite Showcase Division action at the Governor’s Challenge. The 6-foot-1 Conway finished 7-of-17 from the field, but went a cool 13-of-15 from the free throw line - including 11-of-13 in the second half as the game got tight. The Lions needed every one of those points to counter Hyland, who finished with 34. The game was a good test for the Lions, who are expected to be in the mix for a state championship this year. The Lions will face Pennsylvania power Neumann-Goretti on Friday to close out their Governor’s Challenge trip. St. Charles (Md.) opened in 2014 and is still in the beginning stages of building its basketball tradition. So when the Spartans got a chance to gauge themselves against one of the nation’s most storied programs - 16-time Maryland state champion Dunbar - they jumped at the opportunity. Bowman scored 14 points and grabbed 11 rebounds as the Spartans took the Bracket 3 championship with a 64-52 win over the Poets. 2020 wing Darius Miles finished with 11 points while 2022 guard Amir Dade added 10. The win closed out a successful inaugural Governor’s Challenge trip for the Spartans. 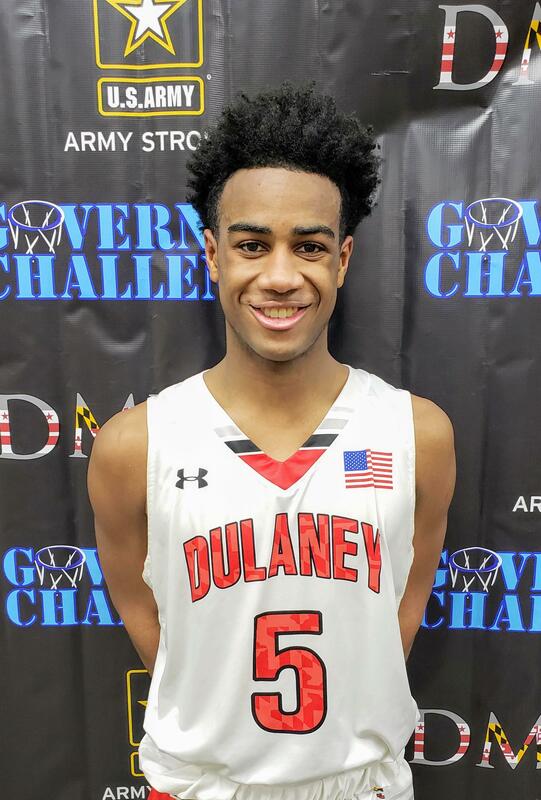 The 2019 guard didn’t get the call, hoping to get to the line and inch Patterson (Md.) closer as it trailed Sidwell Friends (DC) by nine in the fourth quarter. But on the following possession, Price received a dribble handoff at the top of the key and then buried the 3-pointer to make it a six-point game. Patterson eventually lost, 66-55, but Price finished with 27 points on 11-for-19 shooting and bolstered confidence as he continues to recover from a torn meniscus suffered in March. Price, who is a three-star prospect by ESPN, took a recruiting blow when he was sidelined for seven months with the knee injury. As a sophomore, Price led Patterson to the 2017 MPSSAA 2A state title and garnered Baltimore Sun Player of the Year honors in the process. He then transferred to West Virginia’s Huntington Prep for his junior season, and now he’s back at Patterson to finish his high school career, where he’s trying to recapture the same level of relevancy from two years ago. Toting an old blue and yellow ball bag in his right hand and the scorebook in his left, longtime coach Butch Waller stepped toward an exit of the Wicomico Civic and Youth Center. “Hey, it’s cold out there. Make sure to bundle up,” a bystander told the 53-year coach, who was donning his signature white sweater, khaki pants, and white Reeboks. “I’ll be fine. My truck is right out there,” Waller responded, appearing to shrug off the input. Waller is, after all, cleaning up after a grimacing 61-26 loss to Elizabeth (NJ) in Thursday’s DMVelite Showcase game - both literally and mentally. “We’re just embarrassed a little bit but we’ll get over it,” Waller said after the Indians’ first loss of the 2018-19 season and their first regular season setback in roughly a year-and-a-half. Last season, they rattled off 24 straight wins only to lose in the regional quarterfinals to eventual 2A runner-up North Caroline. Like their crushing playoff loss, Wicomico (6-1) couldn’t crack Elizabeth’s ball-pressure heavy defense. The Indians shot just 25 percent (10 of 40) and turned the ball over 25 times on a night Elizabeth overmatched Wicomico with its length and speed, something these Indians don’t see on the Bayside. Wicomico, which brings back dynamic guard Jaden Baker (13 points, five rebounds on Thursday), figures to regroup from the drubbing just a short walk from its home gym and formulate into the 2A East favorite they are pegged to be since the summer. The Indians will take Friday off before taking on Olympic from Charlotte on Saturday evening. Los Angeles-based Veritas Prep became the first California team to take part in the Governor’s Challenge, but struggled to get going in their opener against Central Pointe (FL) on Wednesday and lost 72-44. With a day to get adjusted they looked much better on Thursday, rallying from an early deficit and holding on to beat Legacy Early College (SC), 58-54. A Mississippi State commit, Molinar tallied a game-high 26 points for Veritas in the win. Veritas fell behind 17-9 after one quarter, but outscored Legacy 18-6 in the second quarter to take the lead and held it throughout an even second half. “We just ran the plays and listened to our coach,” Molinar said. “We watch everything, we’ve just got to follow his instructions and play defense, too. Just getting to the rim, playing hard, playing physical and getting the rebounds - the details and the little things helped us. Veritas will face Lincoln Academy (Ga.) Friday and Virginia Academy on Saturday to wrap up its inaugural Governor’s Challenge appearance and its longest trip from home. Molinar said the furthest Veritas had travelled for a game previously was Arizona. Indian River (DE) 2019 Jamier Felton scored 42 points - including the 1000th of his career - in an 85-79 loss to Walkersville (Md. ), nearly matching the event record of 44 set by Harford Christian (Md.) guard Derrick Orr last year. Felton … Walkersville picked up the win behind 34 points - including 8 made 3-pointers - from 2021 guard Jacob Montgomery, who was coming off of a 39-point performance in a loss on Wednesday. His 73 combined points are believed to be the highest two-game total in Governor’s Challenge history. … Mardela (Md.) 2019 guard Syncere Pinkett dropped 40 points as the Warriors claimed the Bracket 5 crown. … Sidwell Friends (DC) 209 guard Jason Gibson wrapped up a strong week with 32 points to give the Quakers a 66-55 win over Patterson (Md.) in the Bracket 4 Championship game. … St. John's Catholic Prep (Md.) 2019 guard Brycen Hill dropped 31 points to carry his team to Bracket 7 championship victory over Arcadia (Va.), going 13-of-16 from the field and a sizzling 5-of-7 from 3-point range. ... St. Peters (NY) 2019 guard Chris Clancy had 28 points on 11-of-14 shooting to lead the Eagles over Potomac (Va.). New Era (Md.) harassed Queen Anne’s County into 42 turnovers in a 66-57 morning win, with 2020 guard Tyshawn Richardson tallying 11 steals.